Venezuelan National Assembly President Juan Guaido addressing supporters last week after being detained by state intelligence agents. 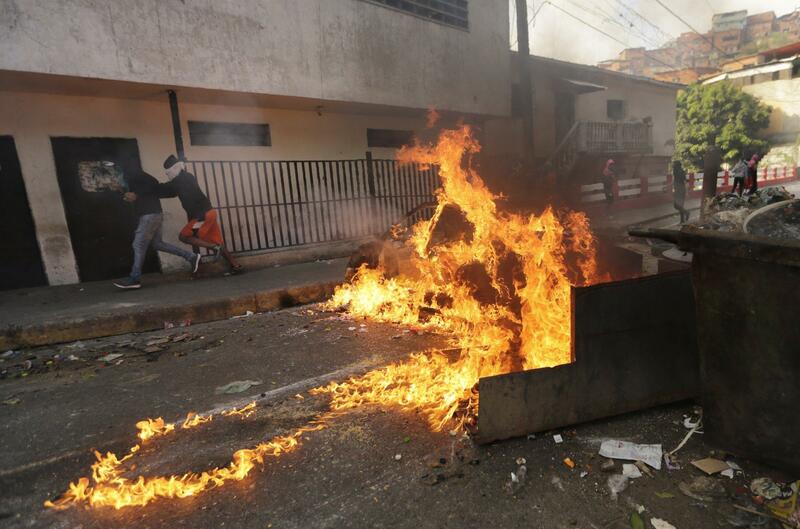 Anti-government protesters set up burning street barricades in Caracas after government forces put down a national guardsmen mutiny Monday morning. That reference to Venezuela’s Constitution is exactly why Guaidó is suddenly a threat to Maduro and his authoritarian regime, which is responsible for Venezuela’s catastrophic economic collapse. On January 10th Maduro was re-inaugurated as President. But most constitutional experts say Maduro’s re-election last year was illegal. If so, technically Venezuela doesn’t have a president right now – and the interim president should be the head of Venezuela’s National Assembly. Meaning: Juan Guaidó. This month he became the president of the National Assembly – which keeps operating even though Maduro unconstitutionally dissolved it two years ago. READ MORE: As Maduro Takes Dispute Oath, Is Venezuela Dangerous As Well As Desperate? In his state-of-the-union speech last week, Maduro mocked Guaidó as “the man the U.S. is calling Venezuela’s new political boss.” But what worries Maduro more is that it’s not just los yanquis calling his presidency illegitimate. Most other Latin American countries – including neighboring Brazil and Colombia – as well as Canada and the E.U. no longer recognize Maduro as President. They now label his socialist regime a dictatorship. By most accounts Gonzalez is right. The international snubbing of Maduro – and the popularity of Guaidó – have given both the exile community and the foundering opposition inside Venezuela a new vitality and momentum. Gonzalez, a civil engineer who heads an exile political project called the Miranda Freedom Chair, recently fled Venezuela with his family because he says the police who arrested Guaidó last week had threatened him because of his work as an opposition organizer. Or at least put him in prison, as has happened to so many opposition figures in recent years. And that’s the big question now regarding Guaidó: Will the regime imprison him – especially if he formally declares himself Venezuela’s real president? So far Guaidó has not done that. But many in the opposition are urging him to – including exile leaders here like Gonzalez. They argue that that dramatic if symbolic move would embolden Venezuelans and the international community to take more forceful action against Maduro. But many analysts inside Venezuela disagree. “That’s really fantasyland,” says Phil Gunson, senior analyst in Venezuela for the International Crisis Group, a conflict-resolution NGO based in Brussels. 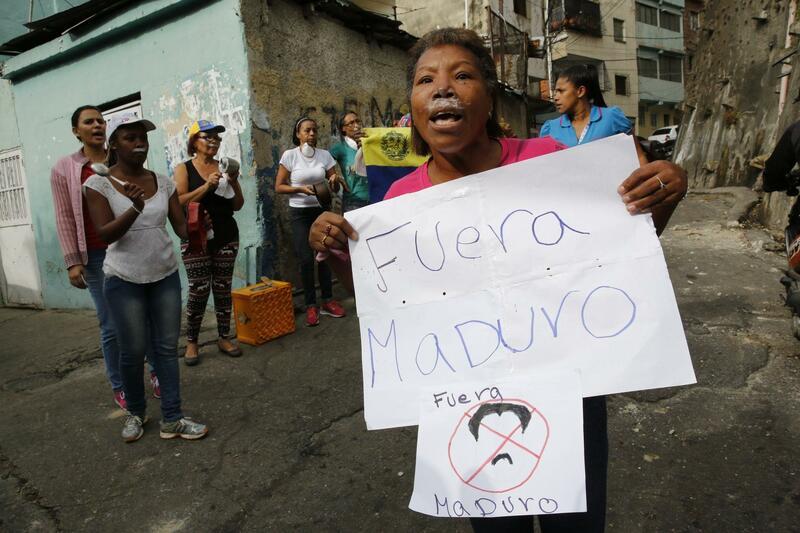 A woman with toothpaste under her nose to block the effects of tear gas demonstrates against Venezuelan President Nicolas Maduro in the Cotiza barrio of Caracas Monday after an aborted military uprising. Which is why Gunson argues it’s better to have Guaidó on the streets instead of in jail – or in exile in Doral. That’s especially true because, unlike many Venezuelan opposition leaders, Guaidó is relatively young (he’s 35) and hails from the working middle class coastal city of La Guaira instead of the elitist confines of the capital, Caracas. Luis Gonzalez del Castillo (second from right) holds up a copy of Venezuela's Constitution at a press conference in Doral last week with other Venezuelan exile leaders, including former Venezuelan Senator Pablo Medina (to Gonzalez's right). Most of the international community is urging Maduro to restore the National Assembly Guaidó heads and let it call a new, legitimate presidential election. Over the weekend, Guaidó said a new government would offer amnesty to military officers who abandon Maduro’s regime – and on Monday that regime had to put down a brief uprising by mutinous national guardsmen. But in an interview last week in Caracas with Miami journalist Maria Elvira Salazar on Univision 23, Maduro was defiant. “I’m confident I’m on the right side of history,” he said, insisting the constitutional clamor was simply pretext for a U.S. invasion of Venezuela. At the same time, Maduro called for dialogue with President Trump. That, however, is most likely Maduro’s fantasyland. New Year’s Eve is a deeply important night in Venezuela – and the more than 100,000 Venezuelans living in South Florida will be thinking hard about family back home tonight. That's because Venezuela is having one of the saddest New Year’s celebrations in the country’s history.